If you are the proud owner of a large Craftworlds collection, you know exactly what treasures you have in your care. We recommend to diligently attend to your models' needs, so that Wraithknight, Wave Serpent & Co. can enjoy a long and healthy life. 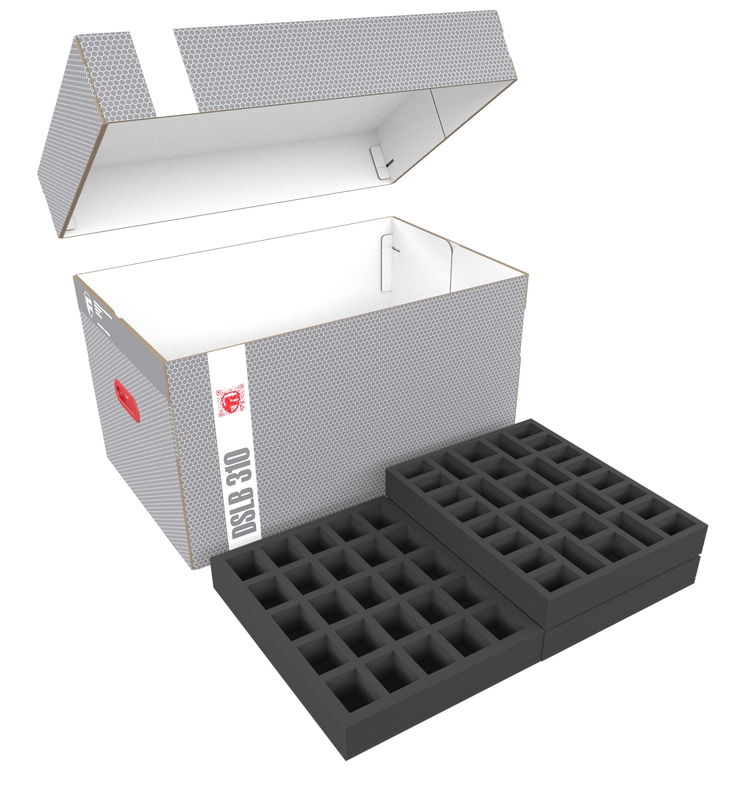 Our Double-Size storage box is jam-packed with high-quality foam which allows you to safely store, sensibly organize and efficiently stow your collection. The tray for the Wraithknight is two-part. The lower part features a custom compartment for the Wraithknight. This ensures optimum protection for the heavily armed battlefield statue. Not only are the sensitive parts, such as wraithcannon and ghostglaive, safe from damage. Also the colors of the painted miniature remain unharmed. In the compartments next to it, units for fast attacks can be accommodated. 4 compartments are reserved for Aeldari warriors on Jetbikes, such as Windriders or Skyrunners. A fifth, slightly larger compartment serves as a parking space for a Vyper. All five vehicles fit into the compartments including the base. Once you’ve sorted the miniatures into the lower part of the tray, just lay the upper part of the tray, which features a custom cut-out for the higher parts of the Wraithknight, on top. The large model is now surrounded by protective foam and the vehicles are completely covered. The two foam trays for the Antigrav vehicles feature a custom cut compartment which can either hold a Wave Serpent troop carrier or a Falcon battle tank. Thanks to the precisely fitting cut, the models enjoy the best possible protection. Sensitive details such as the Shuriken Cannon or the Pulselaser will remain unharmed even during transport. In addition to the compartments for the Antigrav vehicles, the two trays provide two further compartments each. 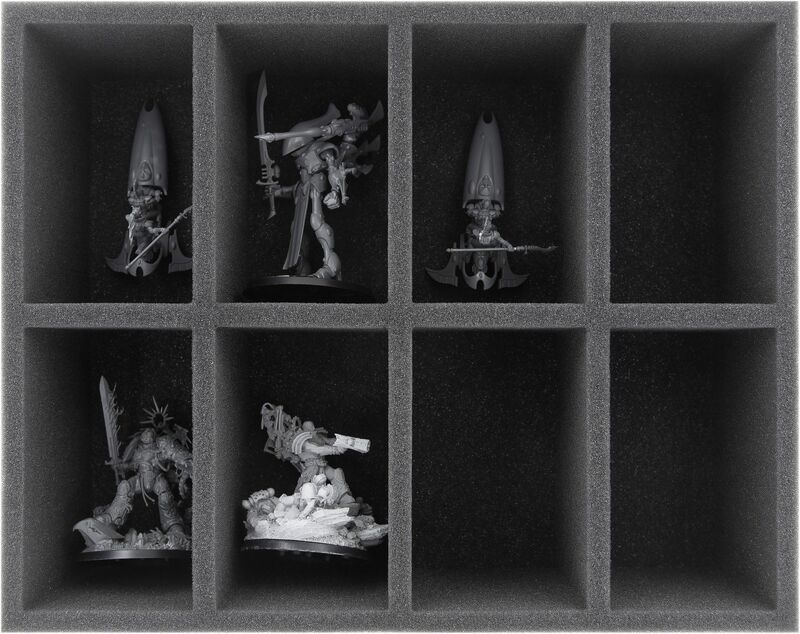 The additional compartments are suitable for e. g. character models like Eldrad Ulthran or the Autarch. 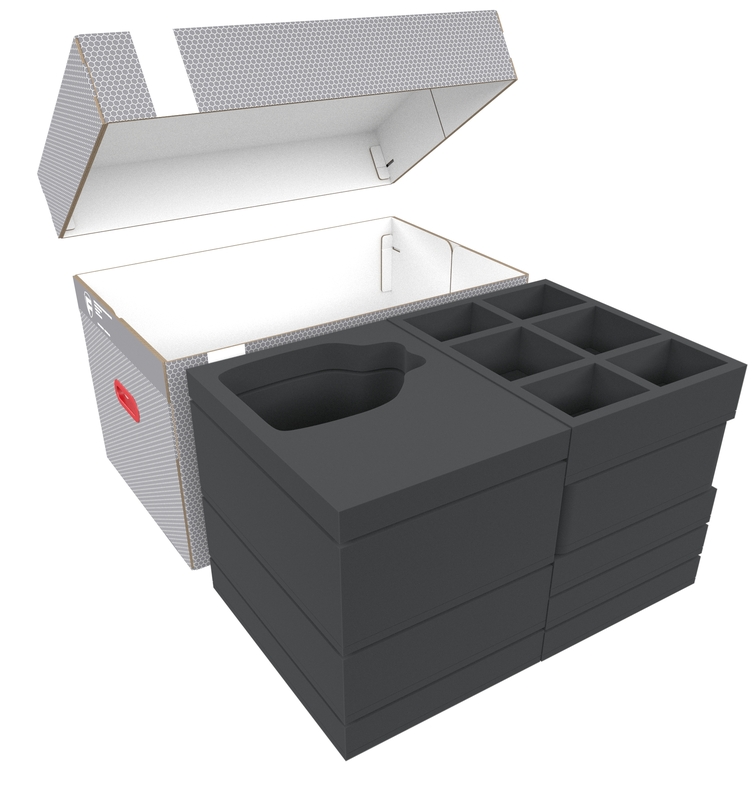 Each of the two compartments is 71 mm long x 50 mm wide x 80 mm deep. 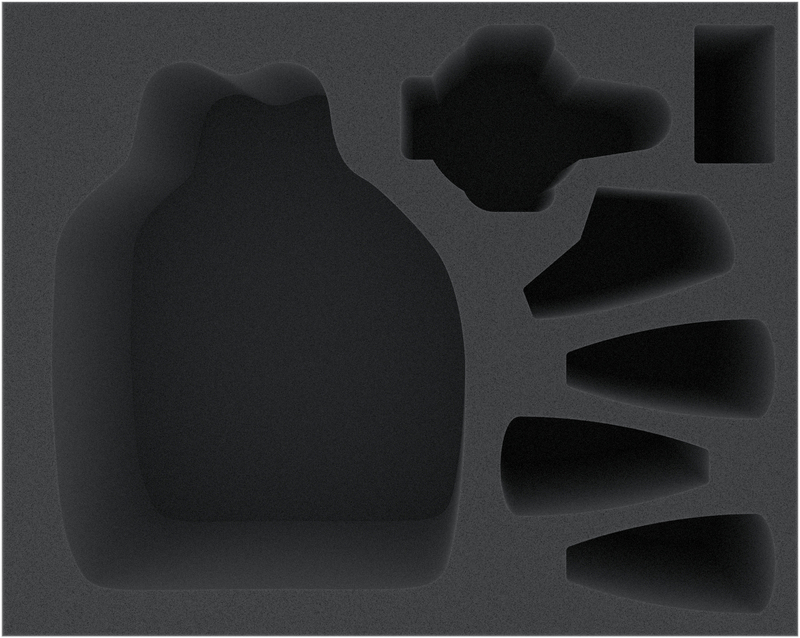 The foam tray with the 6 compartments is suitable for vehicles and character models like e. g. Wraithlord. 4 compartments: 115 mm long x 85 mm wide x 60 mm deep. 2 compartments: 115 mm long x 115 mm wide x 60 mm deep. 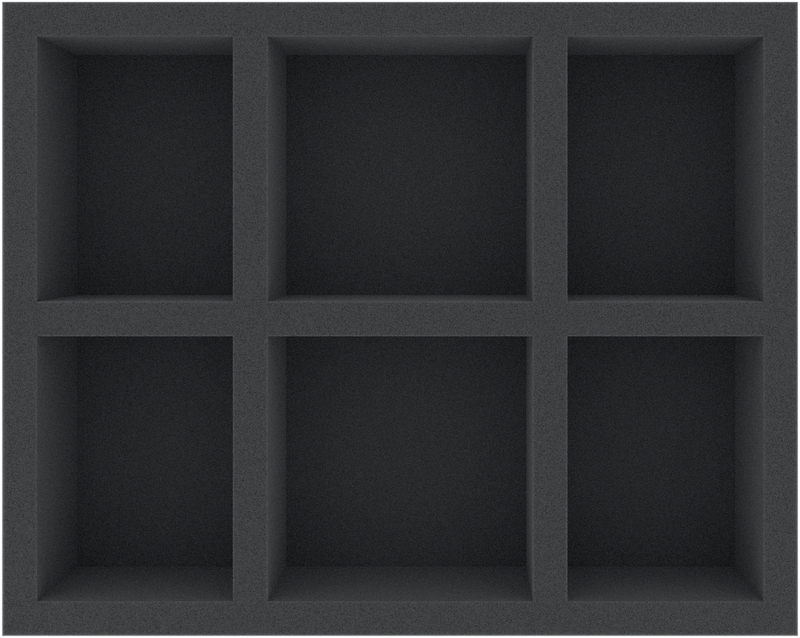 The tray with the 8 compartments will hold further character models and/or vehicles. Each of the 8 compartments is 122 mm long x 74 mm wide x 80 mm deep. 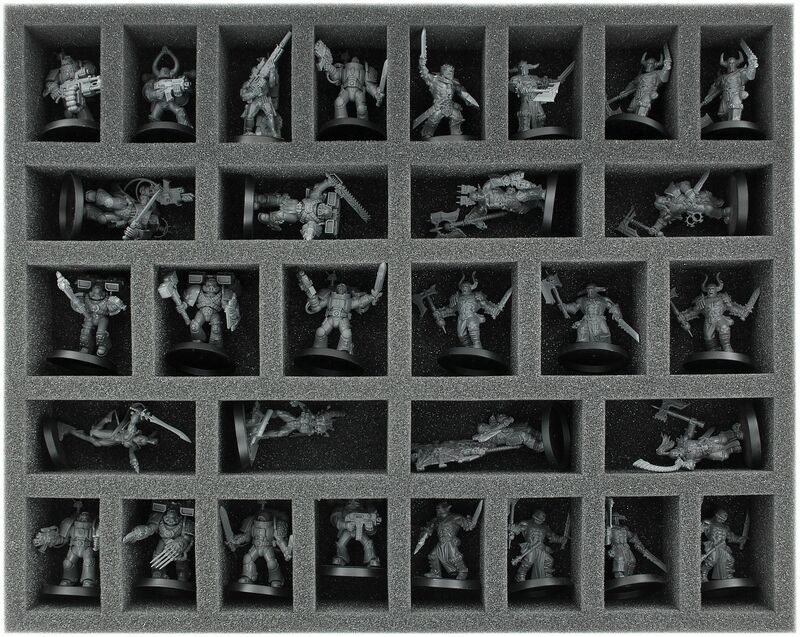 Standard warrior models on 32 mm bases are best accomodated in the foam tray with the 32 compartments. Each of the 32 compartments is 54 mm long x 35 mm wide x 40 mm deep. 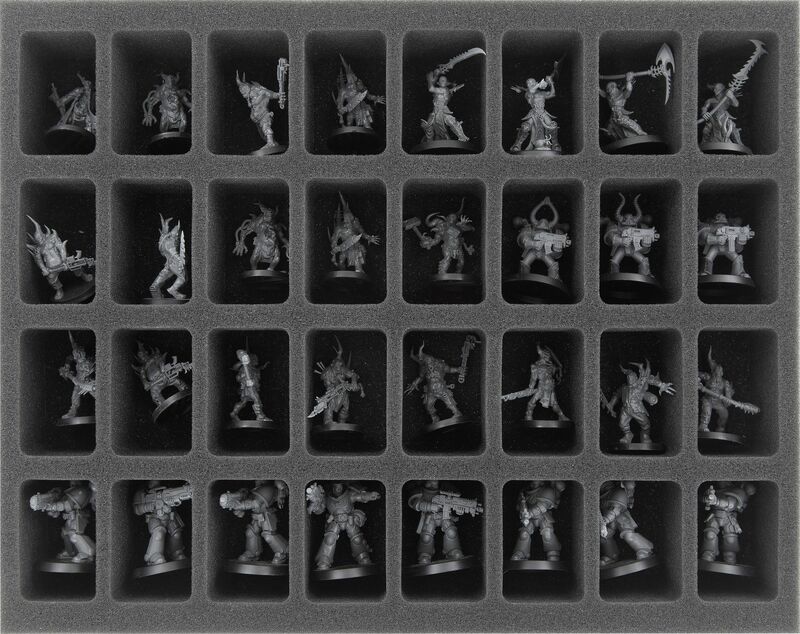 The foam tray with the 25 compartments is ideally suited for standard warrior models on 40 mm bases. 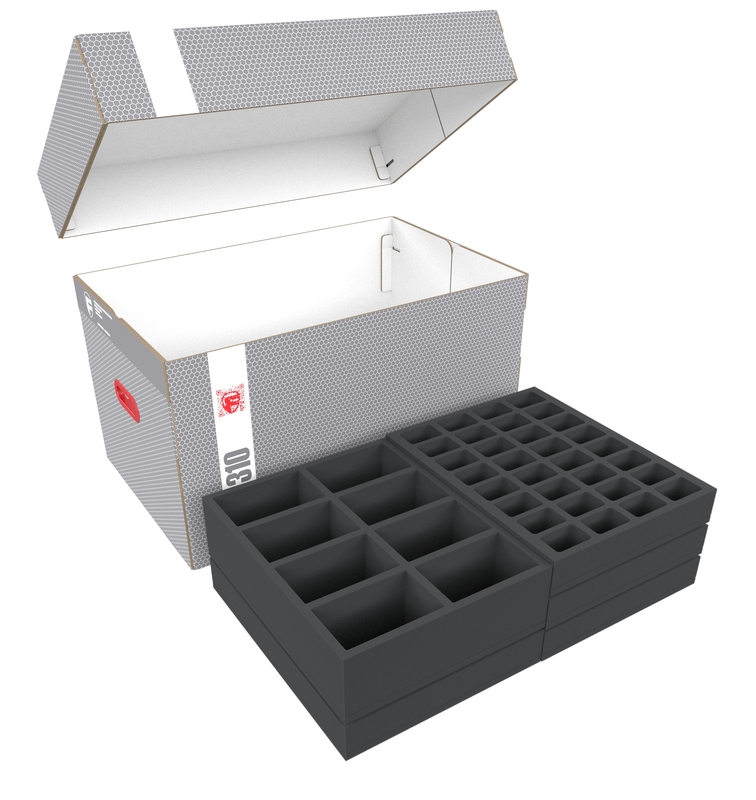 Each of the 25 compartments is 54 mm long x 41 mm wide x 40 mm deep. 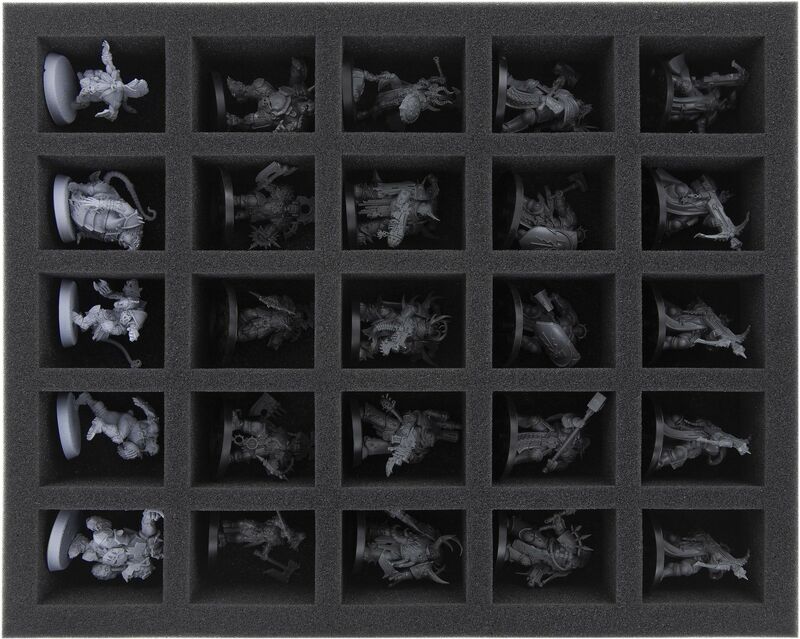 Finally, the set provides two foam tray with 30 compartments each for differently-sized miniatures on 32 mm bases. Of course, the tray fit exactly into the sturdy Double-Size storage box. 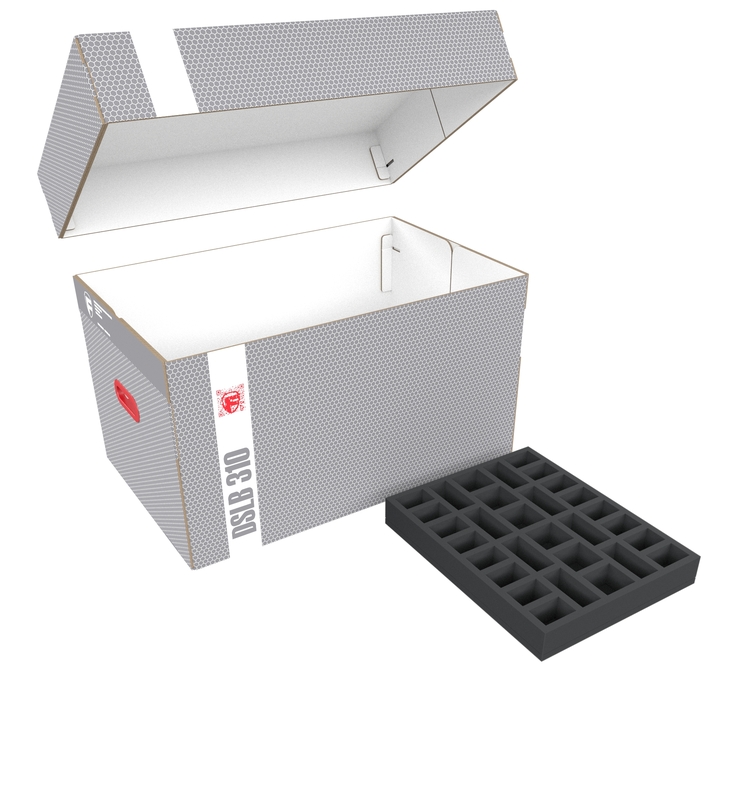 The box is made of coated, double-walled cardboard. It is therefore both very light and very stable. 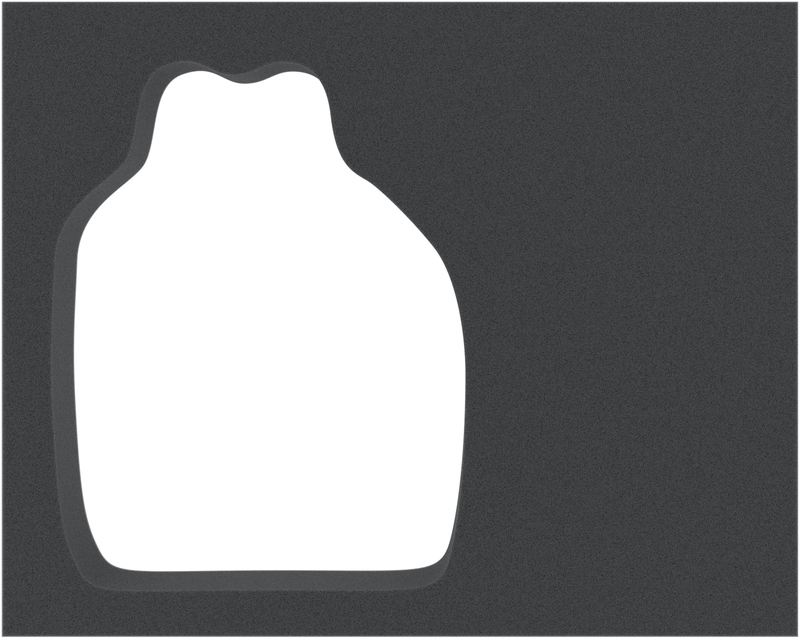 The attachable lid reliably protects your miniatures from dust and other external influences. 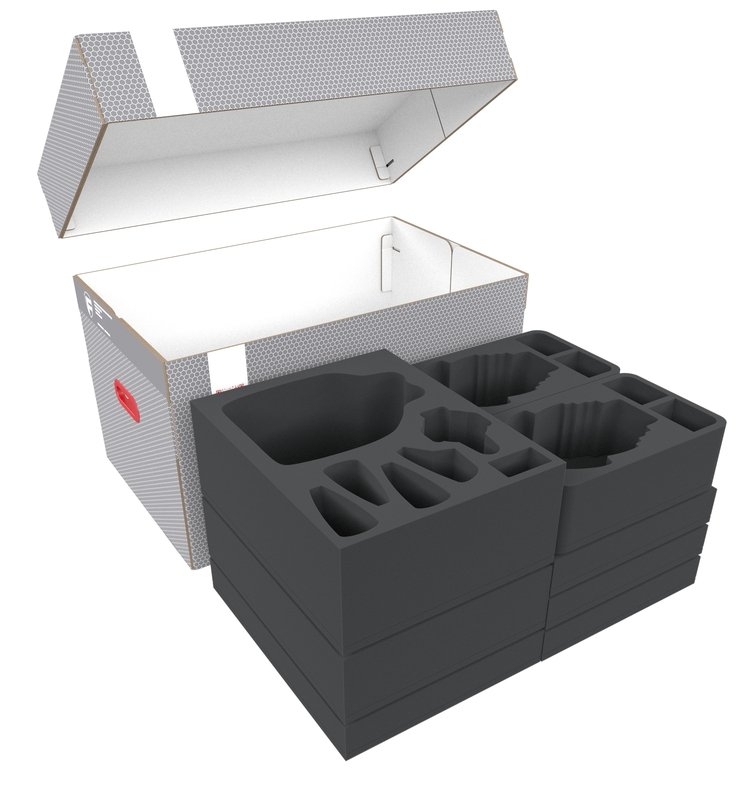 With the two plastic-reinforced carrying handles on the sides, you can transport the box very easily. The matching foam topper completes the Set. 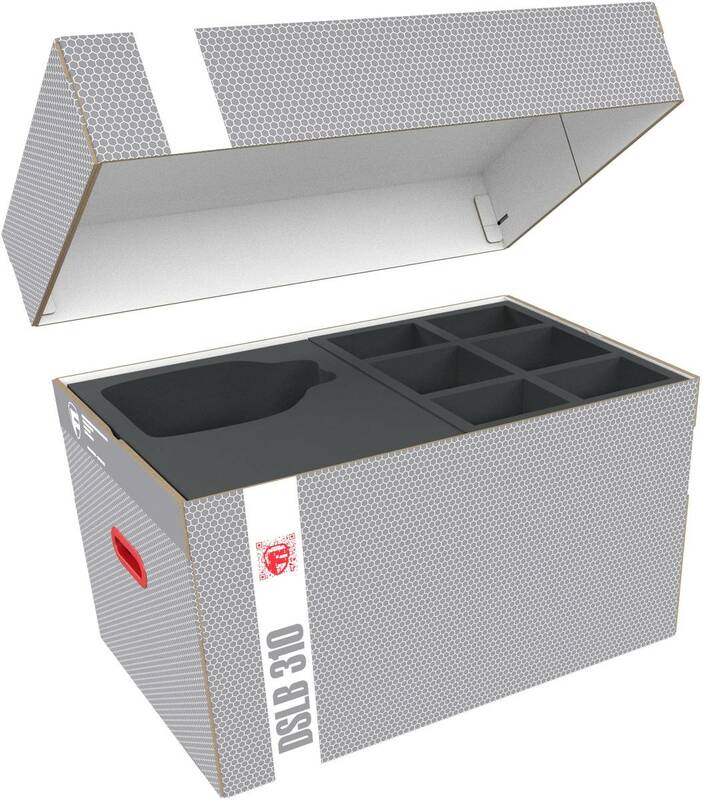 Just place it on the uppermost tray to ensure that nothing can fall out or bump against the lid of the storage box.